Chocolatiers around the world have long since recognized the superiority of Arriba Nacional cacao beans, but only recently have Ecuadorian labels emerged in America. Photo Credit: Republica del Cacao. LOS ANGELES, CA--(Marketwire - January 6, 2010) - Where do the Swiss go to buy the best chocolate in the world? The Trade Commission of Ecuador says it's a little known fact that Swiss chocolatiers have been traveling to South America for centuries, specifically Ecuador, to stock up on Arriba Nacional cacao. "It's time we let the rest of the world in on the big chocolate secret that's sitting in the Ecuadorian Rainforest," says Eduardo Borrero, trade commissioner of Ecuador in Los Angeles. "Ecuadorian chocolate is organic, sustainable, fair trade, superior in quality and when Americans discover they can drastically reduce their carbon footprint by cutting out the 'middleman' they will take a serious look at the label for the word 'Arriba' before their next chocolate purchase." Borrero is on a quest to make Ecuador's dream for chocolate a sustainable reality in the United States. Chocolatiers around the world have long since recognized the superiority of Arriba Nacional cacao beans, but only recently have Ecuadorian labels emerged in America. Borrero is hopeful that 'Arriba' becomes synonymous with Ecuadorian chocolate just as 'Champagne' is with French wine. Arriba defines the area within Ecuador where the superior chocolate originates. The name caught on when a Swiss chocolatier was traveling on the Guayas river and asked a boatman unloading cacao sacks where it came from and his response was "de río arriba," or upriver. If you are a chocoholic, you can blame the Mayans who are actually credited with discovering how to turn bitter cacao seeds into a spicy drink. And it was the Aztecs who elevated chocolate's stature by using the cacao seeds as money. To them, chocolate was a luxury drink for warriors and nobility. "When people think about chocolate and its origin they think of Europe, not Ecuador because like many cacao producing countries we have not had the technology to create chocolate bars and sell them directly," says Borrero. "But that is all changing now, and Ecuador has become much more sophisticated in this area so that many cacao farmers and cooperatives can sell direct." Pacari Chocolate (www.pacarichocolate.com), an Ecuadorian family-owned company credited for developing the first single-origin chocolate made entirely in Ecuador. Pacari, which means "nature" in Quechua, an indigenous language of Ecuador, uses 100 percent organic ingredients to ensure safety to Ecuador's environment and is USDA Organic certified. Kallari (www.kallarichocolate.com) is the only farmers' cooperative in the world that harvests, markets and profits from its own line of organic chocolate. Kallari organic dark chocolate is produced by a coalition of 850 indigenous Kichwa families in the Ecuadorian Amazon. 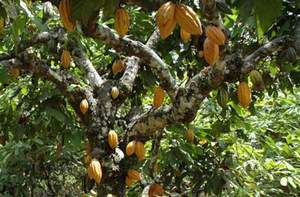 Republica del Cacao (www.republicadelcacao.com) was established as a project to rescue one of Ecuador's most valuable agricultural treasures: Cacao Arriba. Only 5 percent of cacao produced in the world is considered fine aroma, and Ecuador holds nearly 63 percent of that fine aroma flavored cacao worldwide production. Republica del Cacao ensures its dark chocolate's single-origin by indicating the precise GPS coordinates on the label. Caoni Chocolate (www.caonichocolate.com) is produced in the Ecuadorian Andes Mountains near the crystal clear waters of the Caoni River. It is a single-origin, dark chocolate made exclusively from Arriba cocoa beans from three specific regions of Ecuador: Esmeraldas, Manabi and Los Rios. Hoja Verde Dark Chocolate (www.hojaverdedarkchocolate.com) is an Arriba dark chocolate that is USDA Organic certified, supporting dozens of small farmers, their families and the surrounding environment in the Andes foothills of Ecuador. Contact Information: Media Contact: Amy Summers 727-848-1618 ext. 202 Pitch Inc.